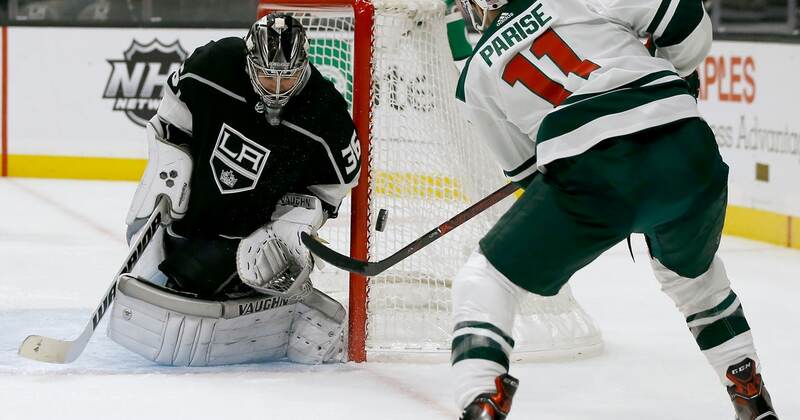 LOS ANGELES (AP) — Zach Parise had a goal and an assist to reach 700 points in his NHL career, leading the Minnesota Wild to a 3-1 win over the Los Angeles Kings on Thursday night. Nico Niederreiter scored on the power play and Devan Dubnyk made 27 saves for the Wild, who have won eight of 10. Parise put the Wild ahead 2-1 at 14:42 of the second period, getting his 700th point in 887 career games. Parise is the fifth NHL player born in Minnesota with 700 points, and his 339 career goals are the most among active American-born players. The Kings got a power play with 1:54 remaining and pulled Campbell for an extra attacker with 1:15 to go, but Mikael Granlund added an empty-net goal at 19:57. The Wild tied it 1-all on Niederreiter’s power-play goal at 14:23 of the first period. Niederreiter had gone 22 regular-season games between goals dating back to the end of the 2017-18 season before scoring on a wrist shot in the paint off a pass by Parise. The Wild have scored a power-play goal in five of their past six games, going 7 for 23 since Oct. 27. Muzzin’s first goal of the season gave the Kings a 1-0 lead at 4:42. Muzzin took the puck from his own zone all the way down the ice and scored on a wrist shot from the left circle. Alec Martinez got his third assist in the past two games. The Kings held a moment of silence prior to the game to honor the 12 people killed in a mass shooting at a bar in Thousand Oaks on Wednesday. Both teams held up signs that said “Enough” and wore stickers on their helmets that said the same. NOTES: Wild C Eric Staal returned to the lineup after not playing against San Jose on Tuesday because of illness. … The Wild scratched RW Matt Read, D Nate Prosser and C Matt Hendricks. Hendricks has not practiced the past two days after playing against the Sharks, when he made his return after missing seven games because of a lower-body injury. … The Kings scratched D Paul LaDue and C Michael Amadio.